With video gaming a sport in its own right, smartphones have no other choice but raise their game too. The Sony Ericsson XPERIA Play has strong ties to Sony’s gaming rigs, both portable and not, and Sony’s a big name in gaming. So, what does all this pedigree bring? Games from the original PlayStation for one, with PlayStation 2 titles coming in the near future. The PlayStation Pocket game store comes with 50 games at launch optimized for the Play. You’ll certainly also appreciate the familiar feeling and design of the gaming buttons. . So, let’s have a look at the Sony Ericsson XPERIA Play. They stitched thumbs to the robot: meaning a DualShock controller stitched to a 4” touchscreen in a side-slider form factor. A smartphone version of the PSP Go but with more processing power isn’t far off the truth either. Especially now that the PSP Go is officially discontinued. That’s the smartphone half of the XPERIA Play equation. It measures up pretty good as a droid and even though it can’t compete with the latest flagships, it’s got more than enough on its spec sheet for day to day use. Mobile gaming is at an all time high. Everyone carries a phone around and everyone has gaps in their day to fill, making mobile games the time-killer of choice for millions of people. Those are usually simple games optimized for touchscreen input, usually with just one or two controls. But some want more compelling games and those require more elaborate controls. 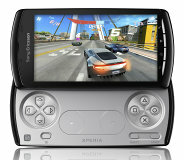 The XPERIA Play is the first phone in recent years that has the proper hardware controls. The added tactile feedback is a major plus. Android also seems as a nice software platform of choice for its potential. Are you ready for round one? You’ll have to complete the hardware inspection of the Sony Ericsson XPERIA Play to unlock the software.